The sundial Serpentis made of cast brass looks very decorative in a beautiful garden. Eequatorial sundial made of cast brass. Diameter 40cm. The sundial has lost none of its fascination over the centuries. Sundials used to be the masters of the time. 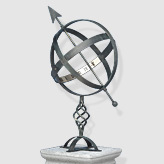 Today sundials are more of an aesthetic function, and they make people think about the phenomenon of "time". 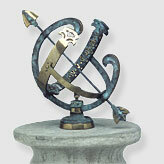 The cast brass equatorial sundial Serpentis is manufactured using the manual sand mold method. The brass is resistant to corrosion even under the influence of seawater. The brass takes on a natural patina over the course of time. This gives the historic sundial even more authenticity. The meridian ring of the serpentis is modeled after a snake. 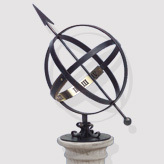 It is ideal as a romantic garden decoration, the 40cm diameter quite impressive sundial on a wall or stone pillar. We also offer a matching pillar made of artificial concrete as an accessory. The delivery of the pillar is included in the price for deliveries within Germany. Please ask for details on deliveries abraod if required.